BLOODSTRIKE #1 & 2 (1993) IMAGE COMICS DAN FRAGA! ROB LIEFELD! 1ST PRINTS! 1993 Image Comics-Supreme-Vol 2 No 3-Bloodstrike! 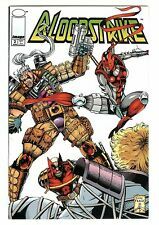 Bloodstrike Vol 1 #2 Image Comics Buy More and Save!